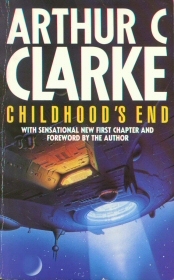 One of Clarke’s most captivating stories, Childhood’s End seems at first to belong to the “First Encounter” sub-genre of science fiction. Riding huge starships, an alien race appears in the skies of the world, making the human race for space irrelevant (the book was published in 1953). They position their ships over the major cities of the world, in a manner that would remind readers in the 1990s of the movie Independence Day. And they appear just in time to save the human race from its games with nuclear weapons. The book is divided into three parts: “Earth and the Overlords”, “The Golden Age”, and “The Last Generation”. Each part presents a different theme, or discusses a different problem, and in fact each part could warrant a book of its own. The presence of all three themes, which are different in nature and quality, in one book makes it a strange mix that leaves an undecided flavor; and yet, all three themes are part of a single plot. The first part, “Earth and the Overlords”, could have made a fantastic short story in the tradition of golden age SF, of which Clarke is considered a master: a problem is presented, and the reader is highly unlikely to guess its solution. The solution, when revealed, is both surprising and entertaining, often twisting the reader’s view of the entire story. The Overlords, as the aliens come to be known, turn out to be the benign saviors and ultimate benefactors of humanity. But here the first theme of the story comes into play: they refuse to reveal themselves. For all their help and willingness, they pose a strict limit, and no human ever has the chance to see what the Overlords actually look like. No human -- but one, who uses the Overlords' trust to cheat them and steal a glimpse. He never tells anyone what he sees. In fact, he denies ever having seen a thing. This is the riddle that faces a now crime-free, mature and peaceful humanity -- as well as the reader. Theories upon theories are suggested, but everybody (the reader included) knows they are nothing but guesses. And when the day comes, and the aliens present themselves in full daylight, several people in the crowd faint. The second part, “The Golden Age”, could have been the most important one, because of the state of humanity that it describes. While no alien spaceship has appeared in the New York sky as of yet, and no Overlord has blessed us with technological frog-leaps, humanity is quickly racing towards the stage where no human labor would be needed. Futurists today fear that in a hundred years, the single most imposing problem that will face humanity, with nearly 100% unemployment, will be boredom. In Childhood’s End, humanity reaches this state not by itself, but with the guidance of the Overlords. And it is the Overlords who provide the solution. Clarke’s work is one of the earliest discussions of this problem, but his solution seems a trite too optimistic for me. The average working week was now twenty hours -- but those twenty hours were no sinecure. There was little work left of a routine, mechanical nature. Men’s minds were too valuable to waste on tasks that a few thousand transistors, some photoelectric cells, and a cubic meter of printed circuits could perform. There were factories that ran for weeks without being visited by a single human being. Men were needed for trouble-shooting, for making decisions, for planning new enterprises. The robots did the rest. The existence of so much leisure would have created tremendous problems a century before. Education had overcome most of these, for a well-stocked mind is safe from boredom. The general standard of culture was at a level which would once have seemed fantastic. There was no evidence that the intelligence of the human race had improved, but for the first time everyone was given the fullest opportunity of using what brain he had. I think that this, the second theme in the book, had the most potential for depth, and it is thus the book’s greatest miss. Third and last, the theme presented in “The Last Generation” is the evolutionary future of the human race. Clarke is known for having a slight fascination with the occult, and here it shows, badly. Once again, the Overlords are keeping a secret from humanity: their place of origin. And once again, by abusing their trust, a human manages to find out the answer -- by becoming a stowaway on a supply ship. And due to the physics of space travel, that single human escapes the future of humanity, and comes back just in time to be a single witness to humanity’s appalling next stage. While reading the book, the reader should keep in mind the very interesting disclaimer that appears on the credit page: “The opinions expressed in this book are not those of the author”. Great Review! Love the part about the mirror to the reader! Great use of quotes.